A look at Canada's crown jewel, Ottawa, Ontario. In our third season, we ventured deeper into Canadian territory. Season one we got to tell Toronto’s tale. This year we would highlight Canada’s capital city, Ottawa. Located right on the border of Ontario and Quebec, you may not have any preconceived notions at all about what to expect in Ottawa. I know we didn’t, but let me tell you, that this town has got A LOT going for it, and boasts one of the most beautiful downtown’s we’ve ever seen on the show. Here’s the skinny on why you should visit Ottawa, Ontario on your trip to Canada. A little background information for you. 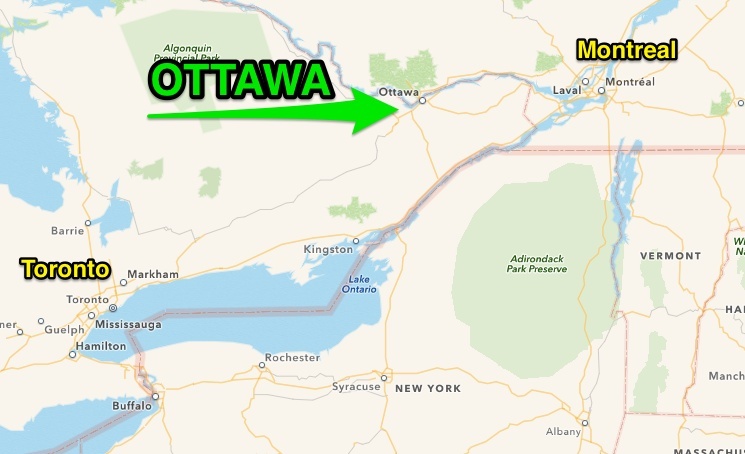 Ottawa started as a settlement called Bytown in 1826, just a few years after the War of 1812. It was named after Lieutenant Colonel John By. He was commissioned with securing a route between Montreal and Kingston that didn’t rely on the St. Lawrence river — which came too close to the New York border for comfort. 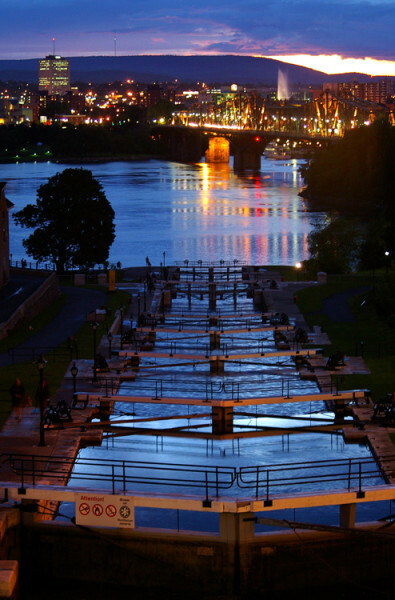 Here he would build the famous Rideau Canal Locks, system of locks that allowed safe passage to the Ottawa river. More on that later. Real lumberjacks. Go get ’em girls. In 1857, Queen Victoria was to choose what city would become Canada’s capital. Despite incredible odds, Ottawa became her choice for a variety of reasons. It was not as close to the border as Toronto (formerly York). See “The Sacking of York” for more information on why that was a big deal. Also, it was smack dab in between Quebec city, in French Quebec, and Toronto, Ontario’s largest English speaking city. It was a nice compromise between the Anglophone and Francophone populations. Not to mention they had that sweet canal and waterway. Thus, is why we visit Ottawa to this day. It is the Canadian seat of political power, and its architectural prowess (as far as North American cities go) is quite unmatched. It boasts world class shopping, museums, food, and recreation. Yes, it’s cold in the winter — bone chilling, want-to-die kind of cold, but it’s that Spring/Summer, oh-so-nice sweet spot, that’ll make you stop second guessing the Queen. The Rideau Canal is a UNESCO World Heritage site and is the main attraction in the heart of downtown. These locks allow boats to enter the Ottawa river safely by raising and lowering their height slowly. Very slowly. Just like a mini Panama canal, a boat enters each lock and a team of workers hand crank the locks open and shut just like they did when Colonel By had them commissioned 180 years ago. It takes around two hours for a boat to complete the system. You can take a pleasure cruise, kayak, or just enjoy them on a sunny day. During the winter the canal freezes and becomes the world’s largest skating rink. People skate to work with their briefcases! How Canadian is that? 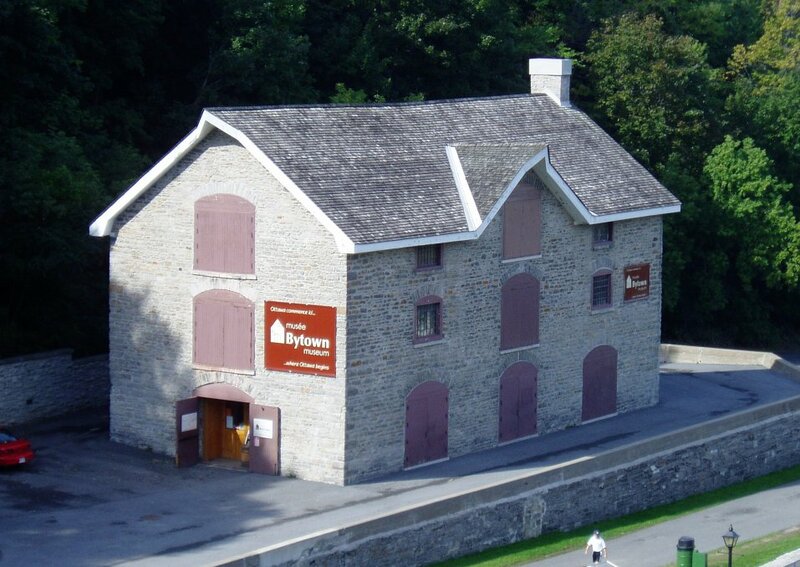 Right beside the locks is the tiny Bytown Museum. The oldest stone building in the city. It consists of a few floors of artifacts and memorabilia of days gone by. No pun intended. Here you can learn the story of Bytown as a lumber powerhouse, and gawk at Colonel By’s hat. They also have a large Union Jack flag recovered from the Parliament fire of 1916. You know this building is old, because it’s even in this 1839 painting of the canal’s construction. Being the national capital means Ottawa’s museums are top quality. The Canadian War Museum is no exception. Although most don’t associate Canada with war, it’s had its fair share. 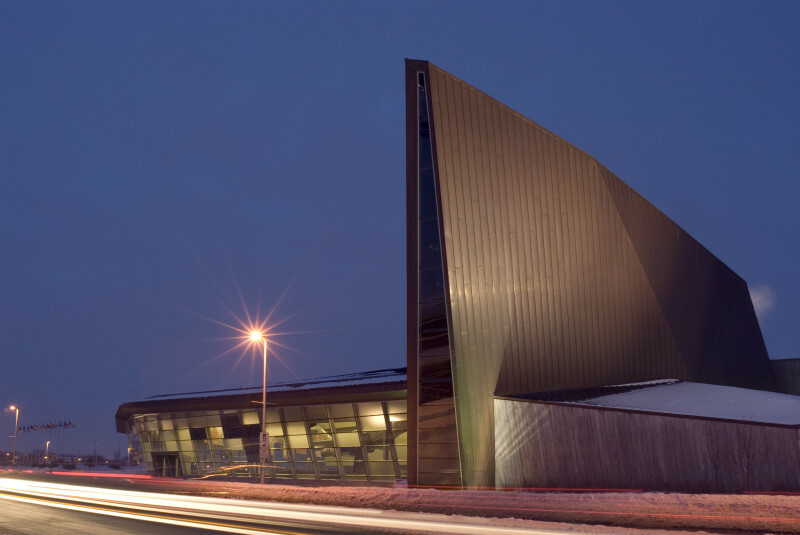 Showcasing centuries of Canadian conflicts, the Canadian War Museum’s exterior is one of its coolest attributes. It juts out from the ground like a shard of shrapnel. The turf roof lends it a bunker-like quality. The windows spell out the name of the museum in morse code. It’s a really cool place! Canadian War Museum in Ottawa. The LeBreton gallery showcases a very large and impressive collection of tanks, armored personnel carriers, cannons and support vehicles.Their most notorious exhibit is Hitler’s limo. To me, “Hitler’s Limo” sounds like the name of a trendy indie band, but they have an actual Mercedes limo which carried Hitler around during some of his numerous screaming engagements around Germany. One exhibition teaches you about Ottawa’s deep Cold War connections by featuring the story of Soviet cipher clerk Igor Gouzenko’s defection. 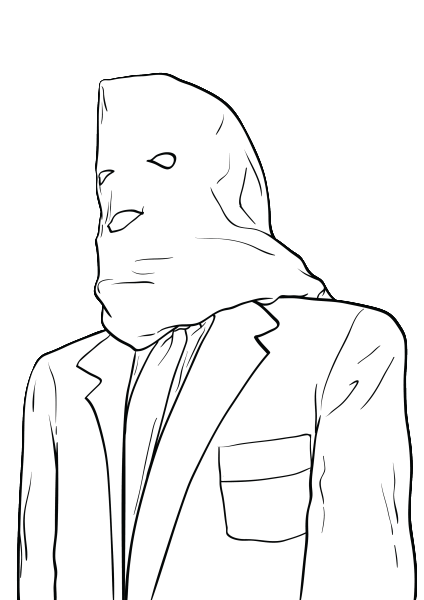 Igor revealed 109 top secret documents to the government in Ottawa in 1945, proving that the Soviets were spying on North Americans. 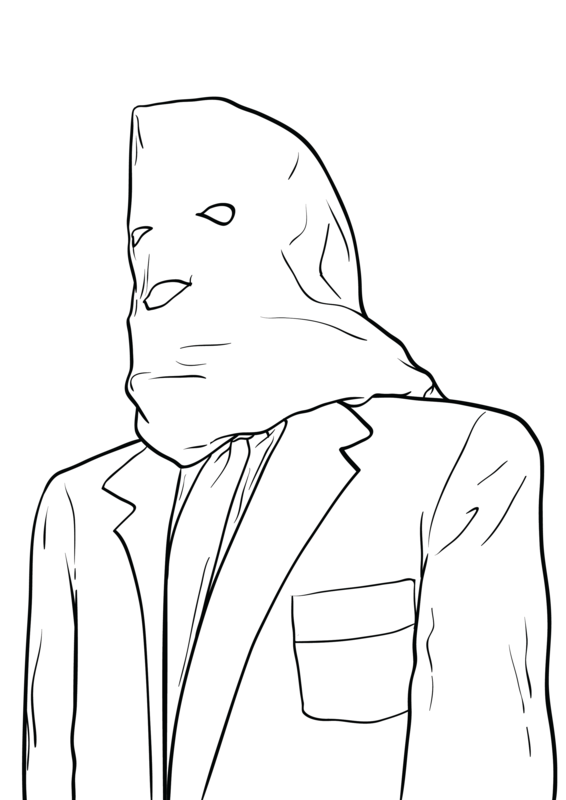 He appeared on CBC TV wearing a white hood to shroud his identity. There’s also a very nice tribute to the Canadian Unknown Soldier in the Memorial hall. On November 11th (Remembrance Day) at 11:00am, the sun’s light hits the headstone, illuminating it. The real reason you came to Ottawa was to see Parliament Hill. This spectacular group of buildings done in Gothic revival style is really something to be proud of. In the centre block is the Peace Tower and clock. You can take an elevator to the top and see all of Ottawa. In 1916 much of the building burned down, but due the swift actions of one man closing the iron doors, the amazing library of Parliament was saved. The library was definitely my favorite part of the Parliament tour. Queen Victoria, champion of all things Ottawa, stands center stage enveloped in a dome of books, copper, and pine. The library is not for the public. It’s intended for Canadian politicians and researchers to use, but it’s part of the tour, and a must see. 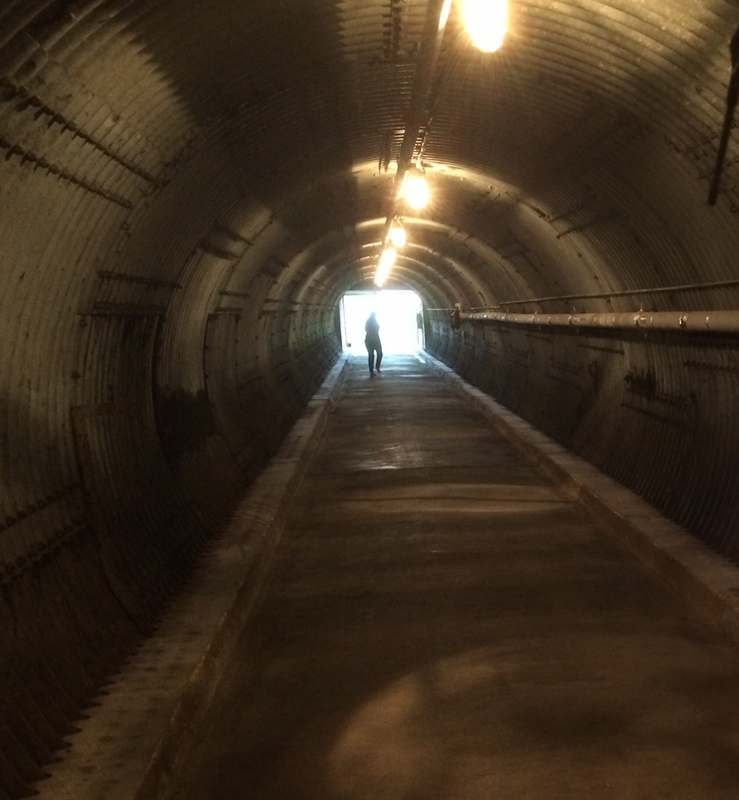 Just when you thought Ottawa couldn’t be cooler, they go and pull out the Diefenbunker. What’s that? Just a hella-cool Cold War museum built into an actual nuclear bomb proof bunker! A few minutes drive outside the city, in an area known as Carp, lies the Diefenbunker. It’s not much to see top side, just a hut, but underground lies a huge multi story facility meant to house Canada’s VIP’s during a nuclear war for up to 30 days. Any time you have to enter a museum through a blast tunnel, you’re going to have a blast. Inside the facility is a creepy, slightly claustrophobic look at the Cold War. Commissioned by Canadian Prime Minister John Diefenbaker in the 60’s, the press called these shelters throughout the country, Diefenbunkers. The building can withstand a blast nearby more than 300 times the force of Hiroshima. Let’s hope it never comes to that. The bank of Canada vault was set to house Canada’s gold reserves. Not so much for blast protection, but radiation protection. Irradiated gold might as well not be gold. Also, see the war room, the hospital, the radiation shower and buy a tee shirt. You love history but you also love to shop. Why not both? The ByWard Market was laid out by Colonel John By himself in 1826 and is one of Canada’s oldest markets. All in a four block area you’ll find museums, cafés, specialty food shops, boutiques, galleries, restaurants, pubs, and more. Take a few hours to stroll it on foot. You can even buy an Obama cookie. It has nothing to do with the US President whatsoever except that he bought some cookies at a shop here. See? Where to Eat in Ottawa? Canada is known as a country with good food, but I’m not exaggerating when I say that Ottawa definitely showcased some amazing gastronomy on our trip. 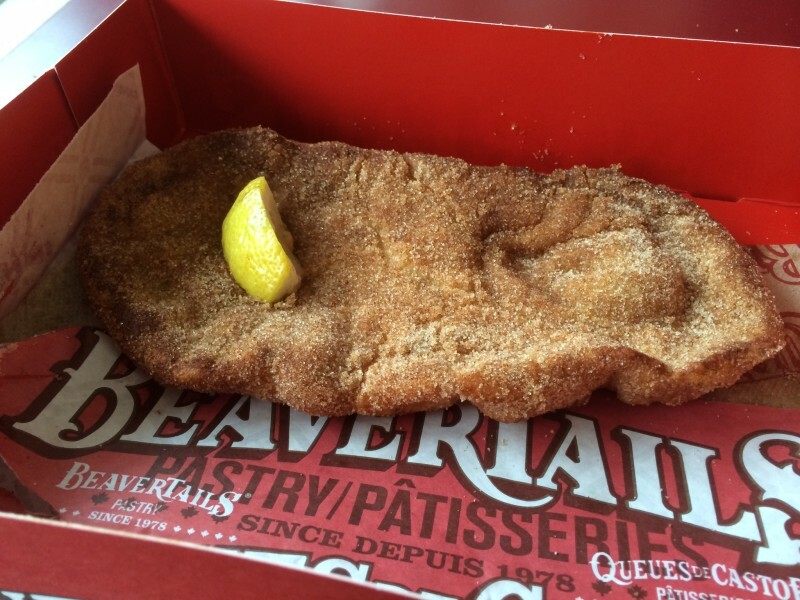 There is one item in particular that you must try when you’re in Ottawa, and that’s of course a Beaver Tail. What is a beaver tail? Well, first and foremost, it’s not an actual beaver tail. It’s a pastry made from fried dough much like you’d get at a carnival or fair. They smother it in various delicious sauces and toppings like nutella, chocolate, maple glaze, cinnamon and even lemon. Have it your way, but definitely have it. You’ll find this pastry chain in other Canadian cities like Montreal, but Ottawa is where it was made famous. A lemon and cinnamon beaver tail known as the Killaloe Sunrise. Right in the heart of downtown is a restaurant you’re definitely going to want to check out. If there was a such thing as the Incredibly Awesome Foods Digest, the Metropolitain Brasserie’s menu reads like its “Best of” edition. Steak au poivre, mussels, oysters, bouillabaisse etc. It’s a Euro bistro with all the trimmings. The restaurant sits right next to the Fairmont Chateau Laurier, a main Ottawa hotel and attraction. Metro, as the kids must call it, has an amazing wine list, and is often considered as having the best service in the city. 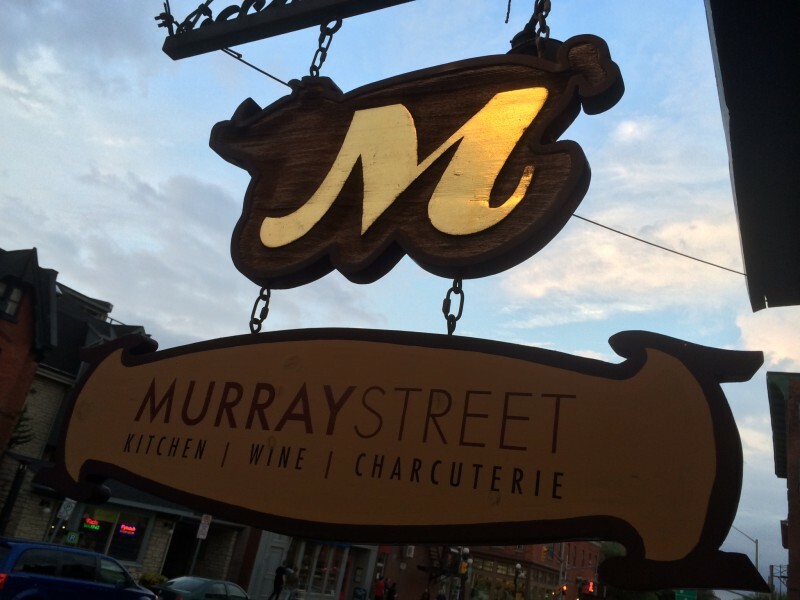 Murray Street bills itself as the place for “wine and charcuterie.” If you’re not familiar with charcuterie, it’s a mixed platter of specialty meats, cheeses, nuts, and jams. To say the food here is decadent is not doing it justice. Heavy sauces, gravies and duck-fat laden dishes are definitely not what the doctor ordered, but at least there’ll be a smile on your face as they put you in the ambulance. The chef’s at Murray Street are not bashful with using ingredients often associated with “offal” cuisine, meaning hearts, innards, and bone marrow are on the menu. But don’t let that shy you away. I had the best poutine dish I’ve ever tasted here. Poutine is a Canadian dish consisting of French fries smothered in a brown gravy and cheese curds. Murray Street added shredded fried duck on top. I told you this place would raise your cholesterol! 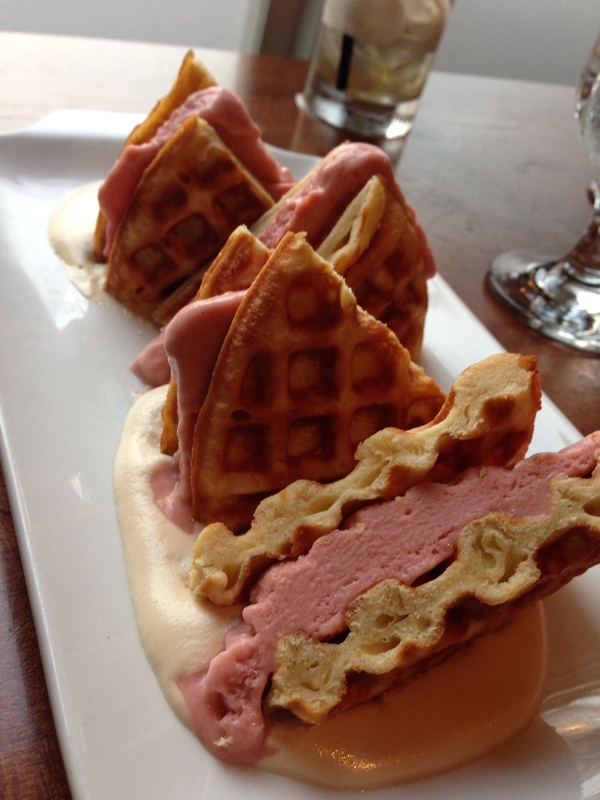 For dessert I had the most amazing waffle sandwich with rhubarb flavored ice cream. Local beers are on tap, and if I had to categorize Murray Street myself, I’d call it a gastropub, and a very fine one at that. Waffle Sandwich with Rhubarb ice cream at Murray Street. 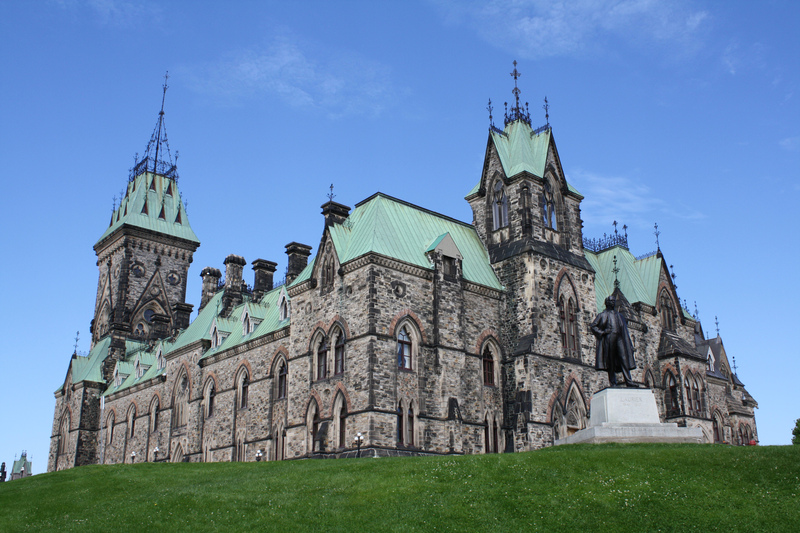 For more information on the trip to Ottawa visit the official tourism board website.